Previous Post The Sunday porch: Plaquemines Parish, La. Absolutely fascinating! So much work and time has gone into those extraordianary arrangements – doesn’t immediately sing ‘wedding’ does it! 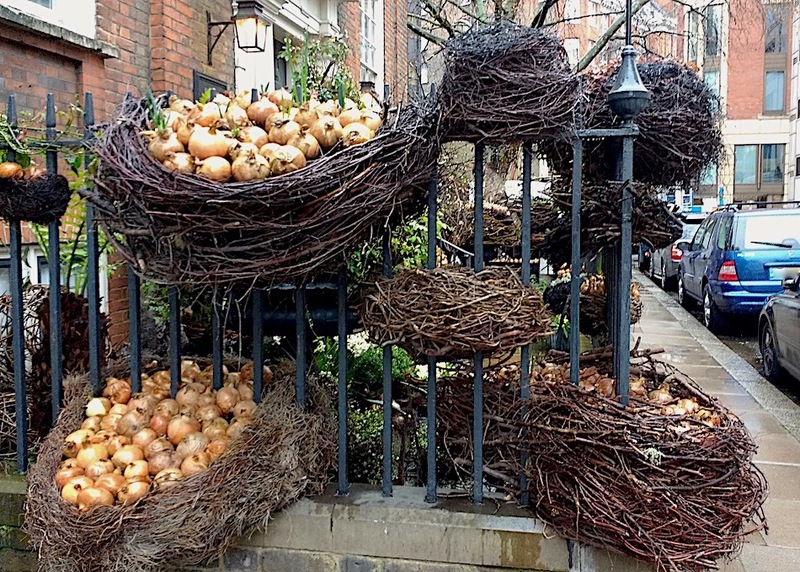 Not the onions, but when you see them used in an unusual way, they are beautiful. These pictures are amazing. Hopefully they will leave the onions to sprout out more. A few were already sprouting. 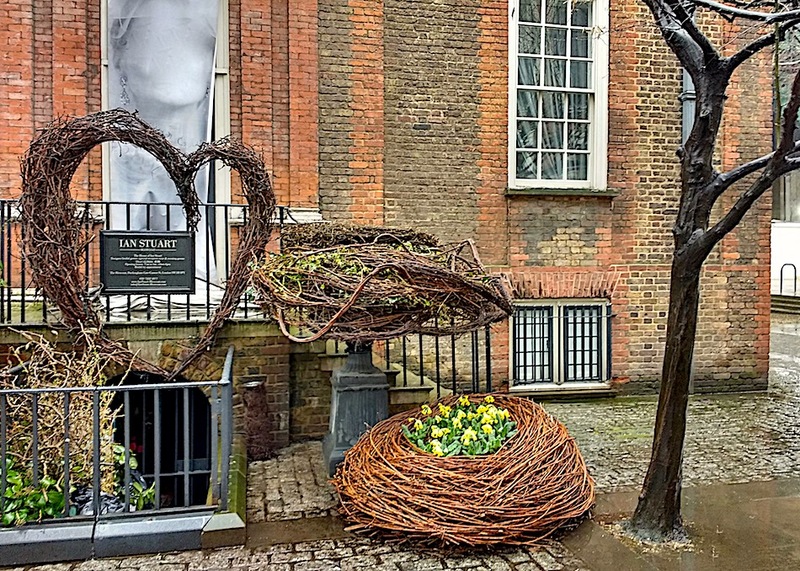 It would be interesting to see the baskets turn green. I’ll have to do a search in a few weeks and see if anyone has posted new pictures on social media. Would be fun to see an update. 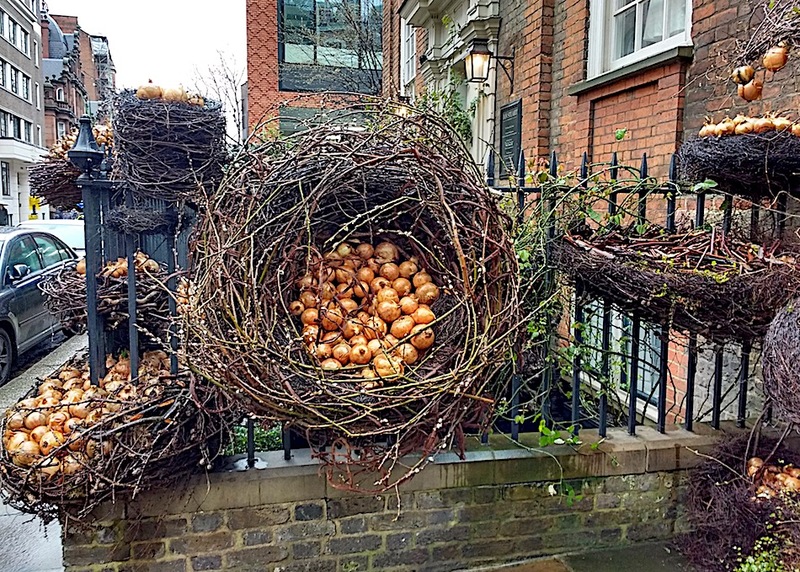 Have never seen so many (beautiful) onions. Impressive! So quirky but what a lot of drama. 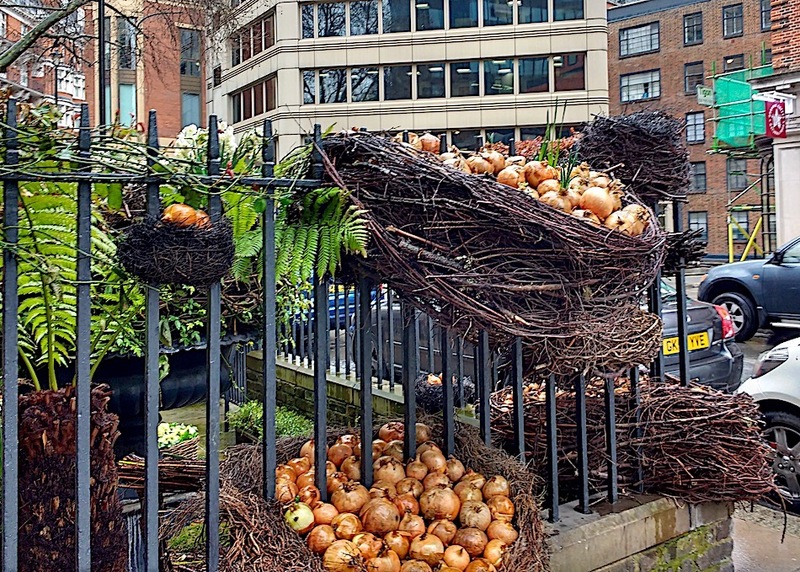 Despite it being onions, it does seem spring-like. And what fun to just come upon it by chance. The statue and name of the building are memorable as well. Our hotel was actually on the same street as the shop, but we always turned another way to get to restaurants, etc., but that evening we weren’t paying attention. 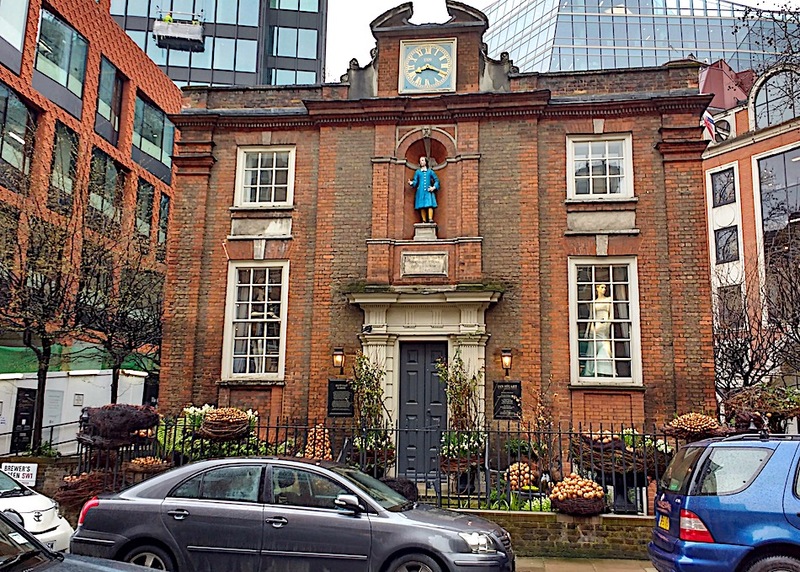 I was amazed to find such a beautiful little structure from the 1700s in the middle of so many modern office buildings — but London is like that. It was a school for poor boys (they had to wear blue or ‘blew’ coats — blue dye was cheaper), but I believe I read that it became co-ed in the late 1700s. 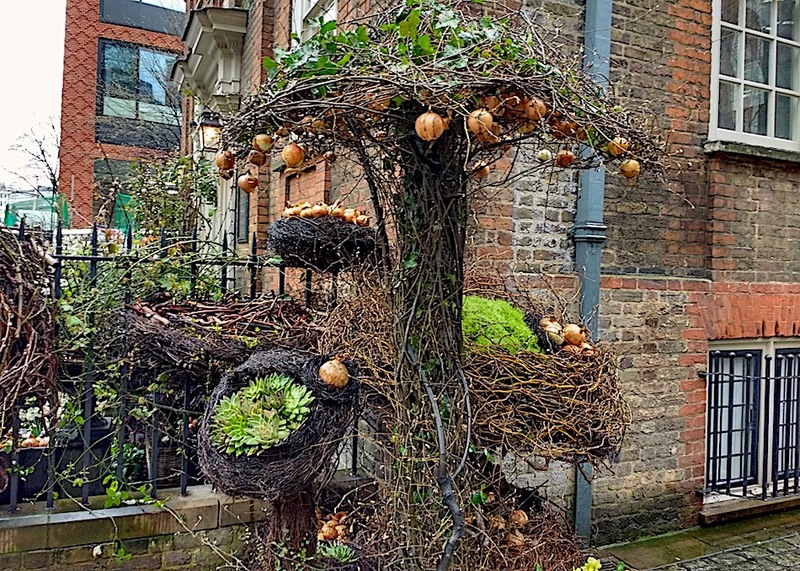 What a lovely bonkers display! I suppose onions do look a little like golden eggs if you squint a bit! You start to appreciate the beauty of onions when you see them like that. That’s great fun! I’m glad you discovered it. Me too. And I’m wondering what kind of display they will put out for summer. 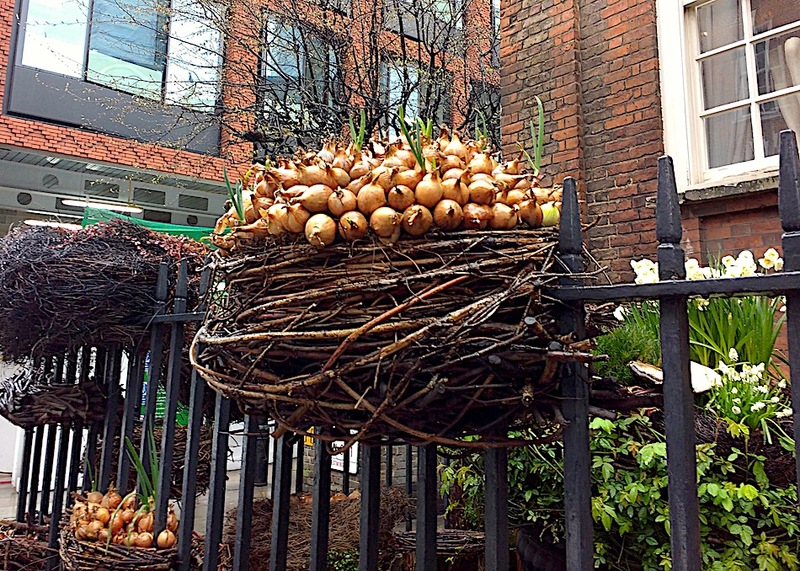 Onions as fruit, eggs, the fecundity of spring. The possibility of new life contained in a bulb. A new life as a couple. 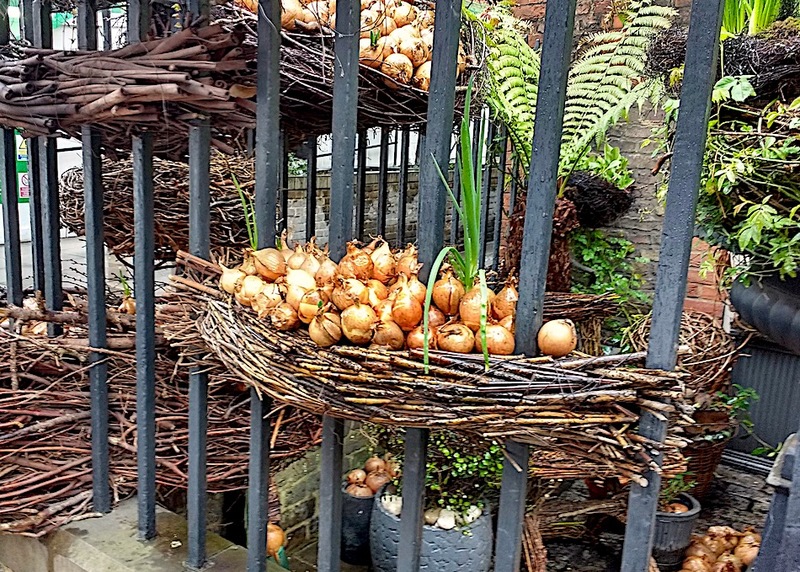 My mind went to St. David’s day & leeks being allium but that’s a bit of a stretch. Thanks for sharing this wonderful work! 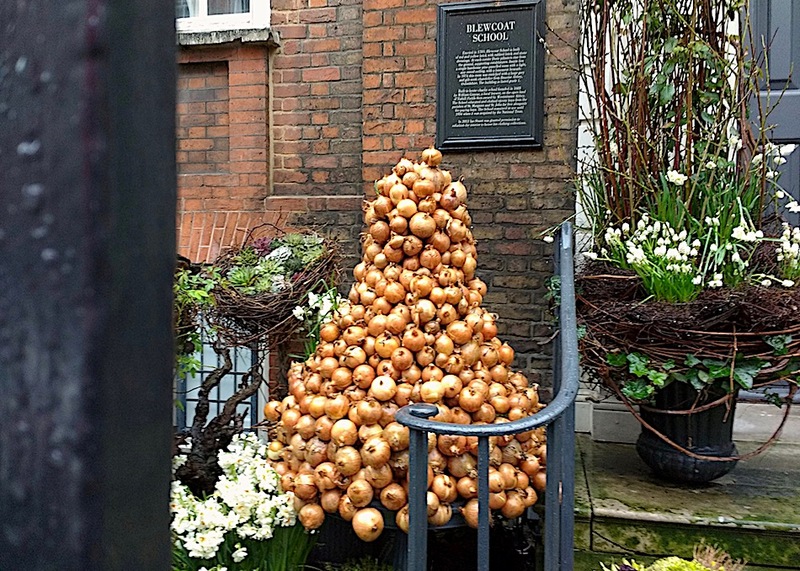 It’s true — onions could be a symbol of unity (marriage) and fertility. And I hadn’t made the connection with eggs in nests until just now. 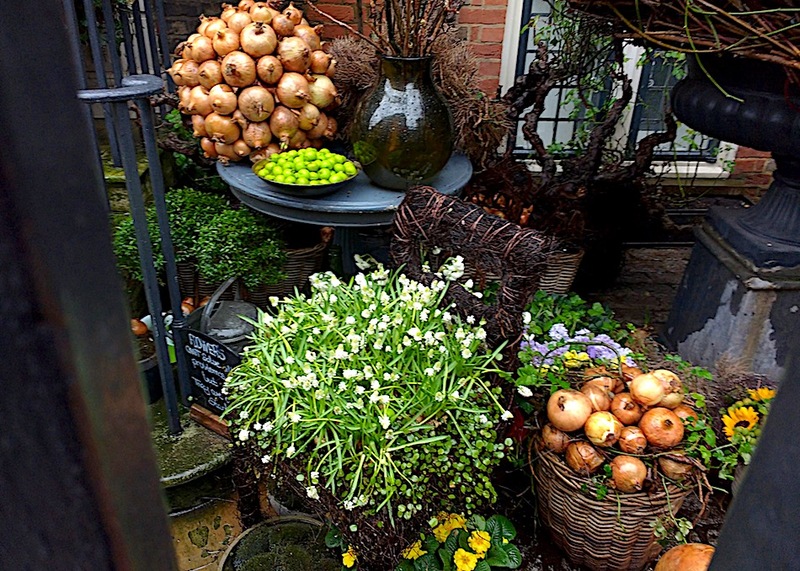 What a beautiful display….and so unusual using the cooking onions. 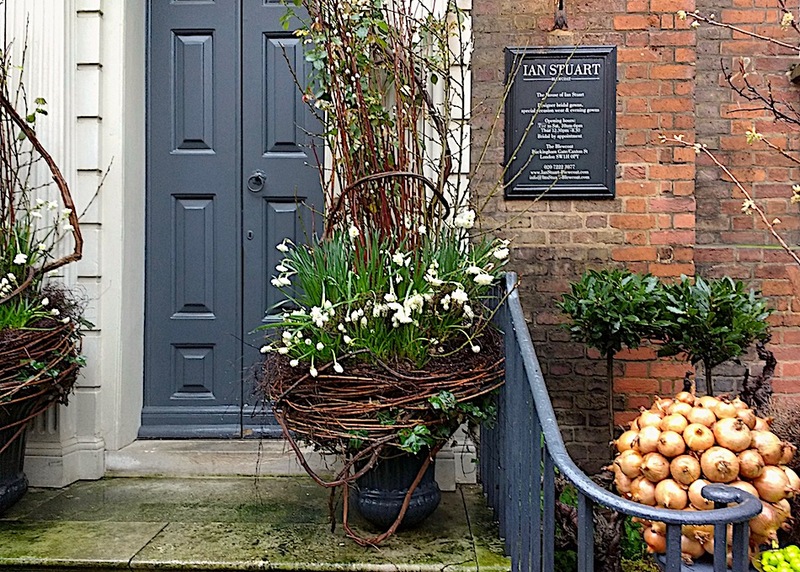 I love all the twiggy baskets filled to the brim with growing things. The twig art was pretty amazing on its own. I have to think they will keep it through the summer — but filled with what? Wish I had another London trip planned. What interesting displays. Thanks for the tour!